The sound of dingoes wailing like banshees breaks the silence of the desert night. We are in Birdsville. Today we venture into the desert. Sand flags are attached to our vehicles and straps are checked and tightened to make sure everything is ready for the desert crossing. We take a trip to the tourist information office to buy our desert parks pass and we are ready to go. A refuel at the servo and a detour past the bakery for a coffee and cake is all we need to set us up for the journey. Birdsville has lived up to its reputation. A friendly place with every facility a traveller could need. It may be a remote destination, but it has the feel of a real town with a strong community. A few kilometres outside the town, we stop for the obligatory photo beside the road sign to Big Red, the famous sand dune. 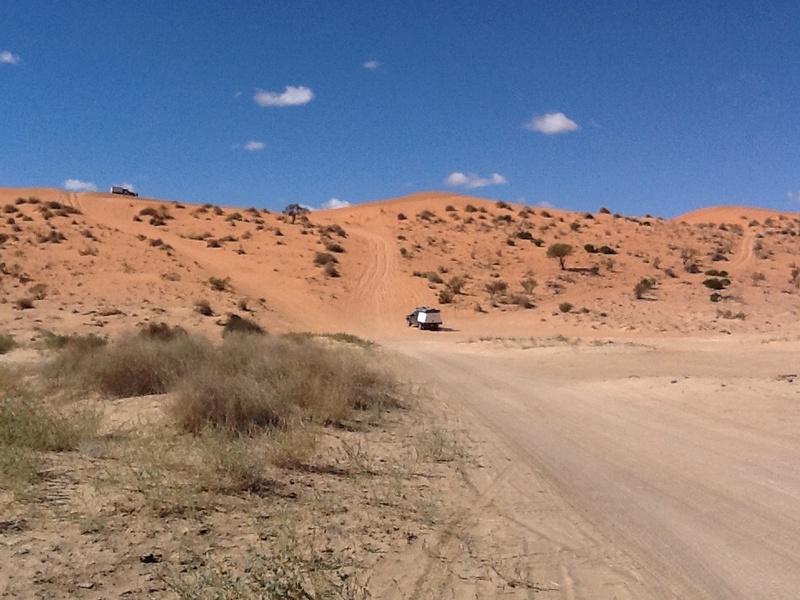 Big Red is the highest dune in the Simpson desert, standing at around 50 metres. It lays down a challenge to our drivers that they are keen to accept. As we prepare to leave the photo spot Brett and Christine find their ute will not start. A dead battery is the cause. We thank the desert gods that the battery has failed so close to town, where it is easy to buy a replacement. Out in the desert this would have been a more challenging problem to solve. 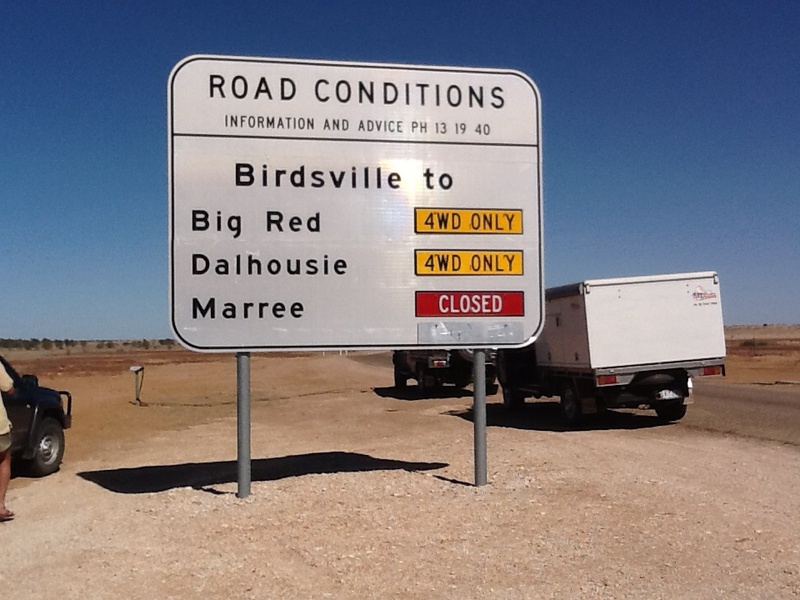 Back to Birdsville we go. It does not take long. Battery purchased, fitted and tested and we are off. The Simpson Desert is the world’s largest parallel dune desert. It is made up of over a thousand parallel dunes running along its length from NE to SW. Our route will run from E to W, along the QAA line to Poeppel Corner and then along the French Line to Mount Dare Hotel. We will be moving across and over the dunes and will have some challenging 4WD action ahead of us. The first sand dune is relatively easy to climb, but we novices feel a surge of excitement when we successfully reach the other side. Next comes Big Red. 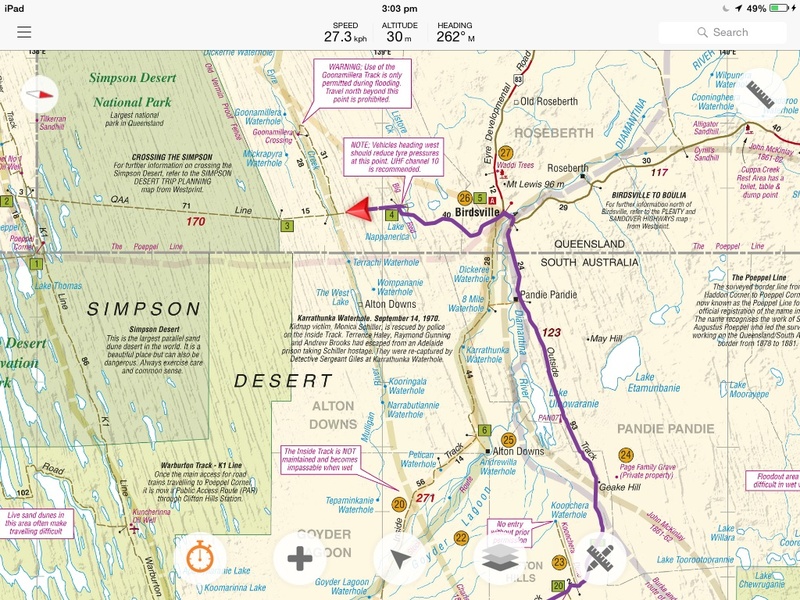 It is slightly off the main track, and is not on our route, but it is definitely on our itinerary. We take the side track towards it, see the dune ahead and the adrenalin starts to run in anticipation. Howard is first to attempt the giant dune. He easily reaches the summit on the second attempt. We see two figures at the top, watching the rest of the team’s attempts. Max hurtles towards the dune and loses power about three quarters of the way up. He reverses back down and powers back for his second attempt. He does it. He and Heather stand at the top looking down. Malcolm and Olive try twice unsuccessfully to climb the dune, but they have conquered it before and decide to sit this one out. Brett steps up to the plate and powers up the sandy incline. 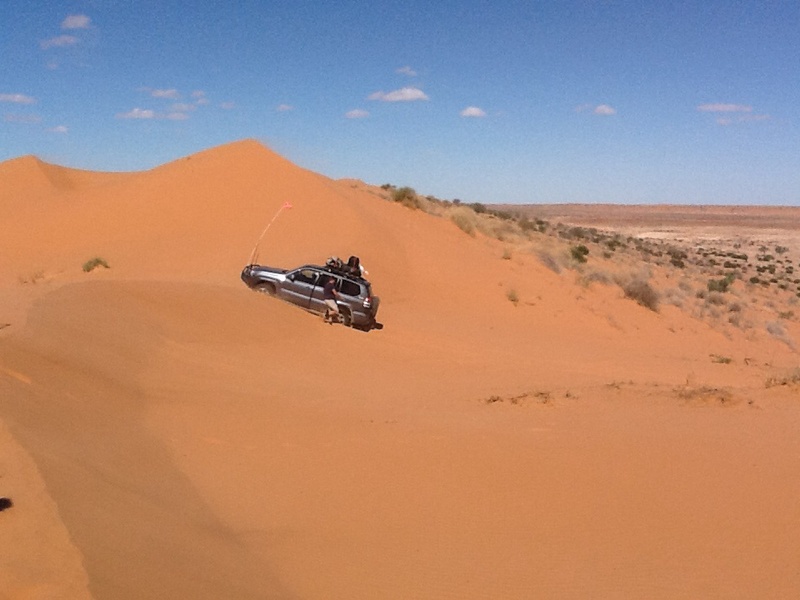 The ute loses power in the middle of the dune. He tries again and gets almost to the top, but can’t find the traction to get through the soft sand at the summit. He decides to call it quits. It’s been a tough day already and he will pass on this challenge. Richard lines up to take his turn. He charges at the dune, wrestling with the wheel to stay on track, only to lose traction midway. Four more attempts in different gears see him climb to the very top of the dune, only to lack enough power for the final push over the crest. Another group of vehicles approaches the dune and he knows he only has time for one more try. He is determined to conquer the colossus and his face is set as he lines up for his attempt. The radio crackles with advice on the gear to select, “Low 2”, “High 3”. He selects low 3 and manoeuvres the ISUZU to the starting point. At the last minute he flicks off the air conditioning, hoping that might help him find the extra few horse power he is looking for. Off he goes, power on, up to middle of the dune, the vehicle gains traction as he turns to the left and the ISUZU pushes forward, finally easing over the crest and on to the summit. A shout of exhilaration and he’s out of the vehicle, punching the air. Mission accomplished. With the excitement of Big Red behind us, we continue our drive into the desert. Every dune presents a different driving challenge. The convoy soon gets into the groove and we make slow but sure progress through the afternoon. Beryl calls out over the radio, “We’re in paradise!” We climb the dune to find a treed plain below us that reminds me of an olive grove. The flat plain between two distant dunes is dotted with silvery grey green trees. We have found our first desert camp site. Wood is collected, a fire is set and we make camp. After a tasty dinner, we sit around the camp fire, looking up at the starry starry night. Earlier in the day, Beryl had laid down a challenge to the group to each write a poem to read around the campfire. What a talented group! The poems each reflected the personality of the author – some comical, others lyrical – all giving a new perspective on the trip so far. I will share a selection of these poems in future posts under the category “Bush Poetry” so that you, dear reader, can hear other voices tell the story of our travels into the red centre of Australia to see the Big Red Bit. This entry was posted in Desert, On the road, Richard and tagged Australia, desert, Outback, Travel on 26/05/2014 by Deb McSephney. Loving your vivid descriptions. It seems that this really is a trip of a lifetime, and you will all be lifetime friends after sharing such an amazing adventure. Thanks Kathy, it’s an amazing adventure and still more to come. Its great to read about your trip as l have heard Howard and Beryl describe their exploits over many years so l am enjoying going along for the ride. I am pleased l have flown over part of your journey to appreciate what you are doing. Thank you Jennette, we love having our friends travel with us through this blog.